Unite Community is organising a meeting and workshops to discuss the effects of current government and council policies on the low paid, unemployed, the disabled and carers – and draw up a strategy for fighting the Tories. Speakers include: members of Unite Community, housing campaigners, Disabled People Against Cuts and Suzanne Muna, UNITE Executive member & housing workers’ representative, and local activists. 8 million of these poor people are in employment! 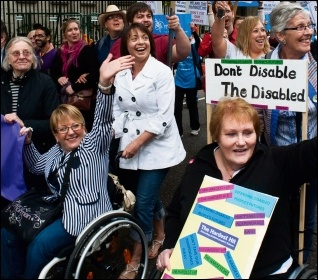 50,000 ‘motability’ vehicles taken from the disabled. Changing Disability Living Allowance into PIP pushed 85,000 people into poverty, Universal Credit will not be any different. No. of rough sleepers has soared by 134% since 2011. For many people the choice is to heat their homes or eat. Cuts to in-work benefits mean that around 3 million families will lose on average £1,300 a year. Meanwhile the bosses and MPs have seen their incomes soar. The gap between rich and poor is bigger than ever. These are not just statistics – behind them there are real people struggling to get by. Perhaps you’re one of them? If you’re affected by changes to the benefits system & Universal Credit, work capability assessments or sanctions, if you’re disabled, a carer, a low-paid worker or jobless, this event will interest you. The housing crisis is the net result of a decade of austerity, putting profit before people’s needs, wage restraint, zero hour contracts; public service cuts, privatisation; the sale of council housing & services; attacks on the benefits system and property speculation & “gentrification”. Nothing symbolises the effects of Tory policies & their callous system more graphically than Grenfell Tower. Many councils are failing across the board, betraying the people who elected them. The new Housing and Planning Act will make things worse as it changes the definition of affordable housing and could be used to benefit property developers and speculators. Council-owned homes and property is being sold off – often for ridiculous prices. Our event will touch on many of these issues. We want to organise and campaign, working with the unions and the community to defeat the Tories and their attacks on the working class. DROP-IN from 12.30 to get info or talk to activists about issues that concern you. We will try to get you the advice/information you need. Join us for tea/coffee/snacks. Find out about Universal Credit which will be rolled-out in Gloucester in February and ask questions – if we don’t have the answer, we will find people to advise you.. Leading members of UNITE the Union – Suzanne Muna National Executive, Unite Community members and local campaigners talk about their experience, how to fight the cuts, organise against austerity and what we can do to help people affected by Tory policies. ← UNITE to support the Day of Action on Universal Credit!